Vapco Steam It Equine Massage Lotion has different options and/or variations, please choose below. This product cannot ship to NM due to state restrictions. 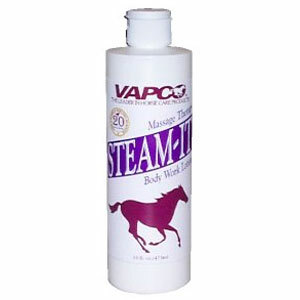 Vapco's Steam It Equine Massage Lotion is especially designed to refresh, rejuvenate and restore the elasticity in your horse's fatigued muscles, while soothing joints and reducing stiffness, increasing circulation to speed healing, and decreasing body pains that are from exercise or inactivity. Formulated to promote mobility prior to exercise in cold, unstretched muscles and feels refreshing after a workout. Soothing on back, loin and shoulder muscles and helps to comfort the stifles, whorlbones, knees, hocks and ankles. Non-greasy and won't stain. Has a sporty, aromatic fragrance. Your horse will enjoy having a soothing massage with this deep penetrating lotion! Choose 16 oz. or 1 gallon.